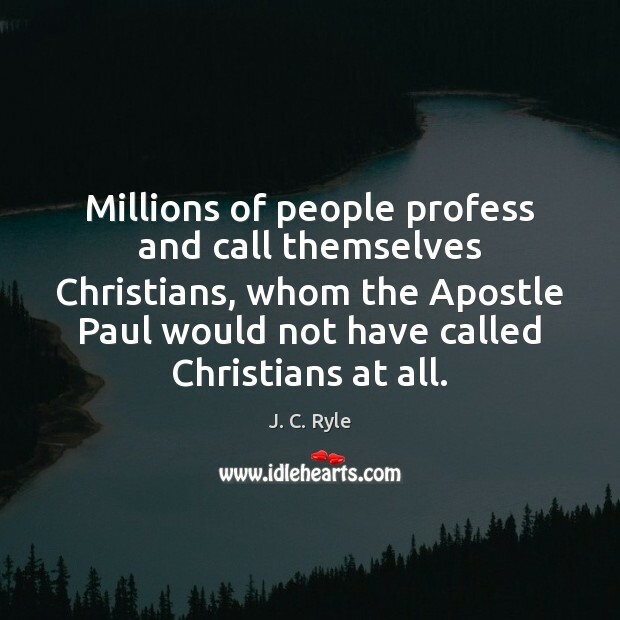 Quotations about Apostle Paul. Quotes to stimulate mind and drive action! Use the words and quote images to feed your brain inspiring things daily! In Heaven we'll understand why we've suffered on Earth. 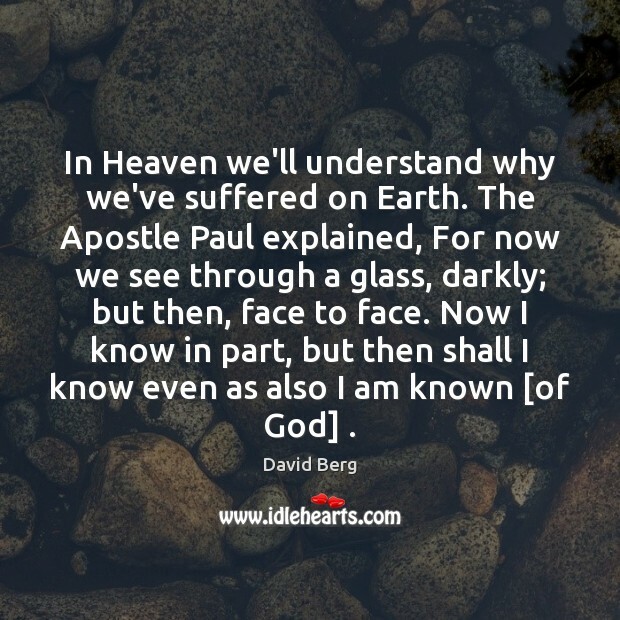 The Apostle Paul explained, For now we see through a glass, darkly; but then, face to face. Now I know in part, but then shall I know even as also I am known [of God] . For centuries, dreams have been used to communicate instruction and direction to people of purpose - great men and women. God used dreams to prepare Joseph for his future as a leader of nations. He gave battle plans to Gideon in a dream. 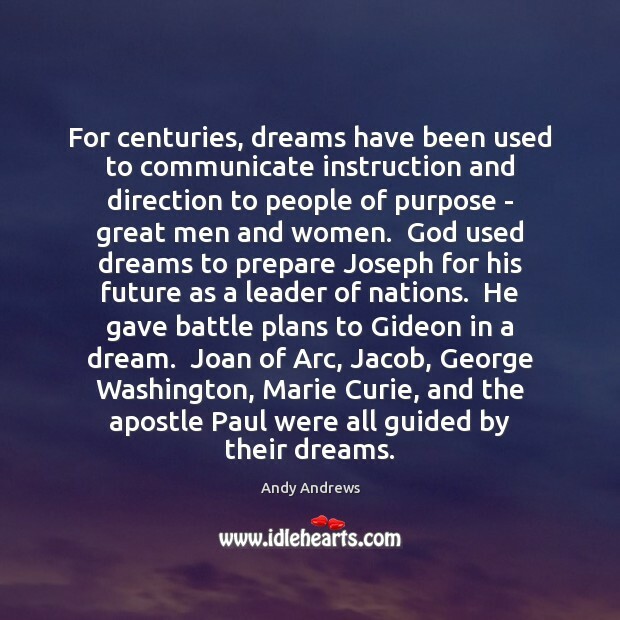 Joan of Arc, Jacob, George Washington, Marie Curie, and the apostle Paul were all guided by their dreams. 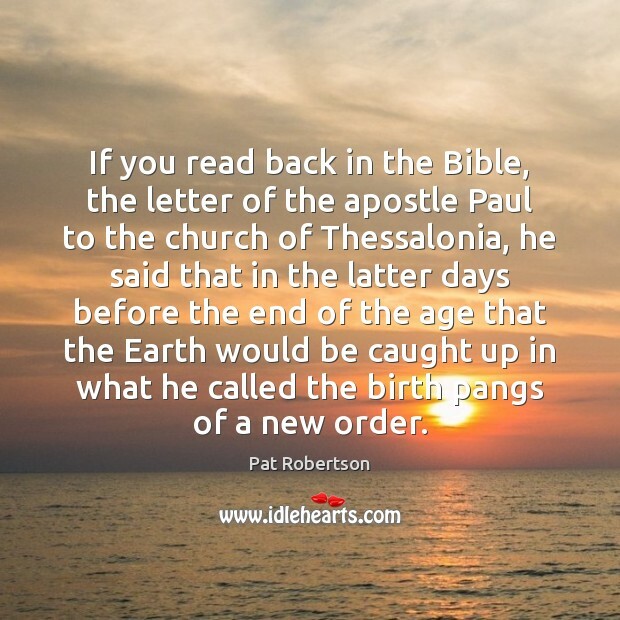 If you read back in the Bible, the letter of the apostle Paul to the church of Thessalonia, he said that in the latter days before the end of the age that the Earth would be caught up in what he called the birth pangs of a new order. 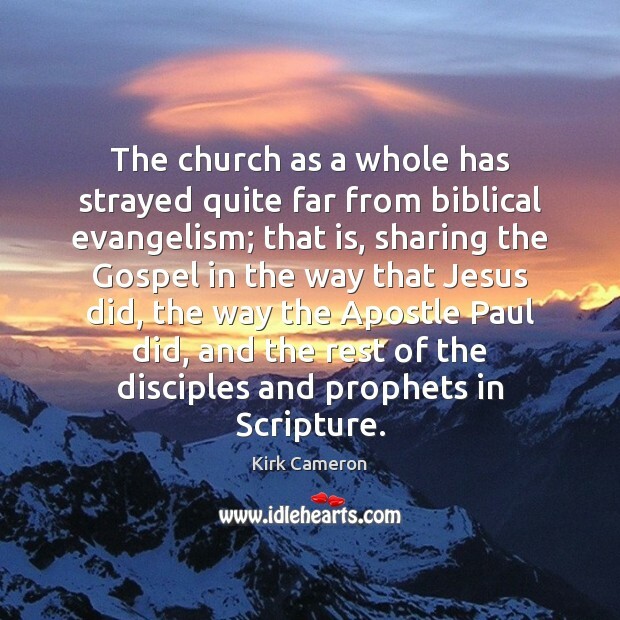 The church as a whole has strayed quite far from biblical evangelism; that is, sharing the Gospel in the way that Jesus did, the way the Apostle Paul did, and the rest of the disciples and prophets in Scripture. The Christian gospel is a message of freedom through grace and we must stand fast in the liberty wherewith Christ has made us free. But what shall we do with our freedom? 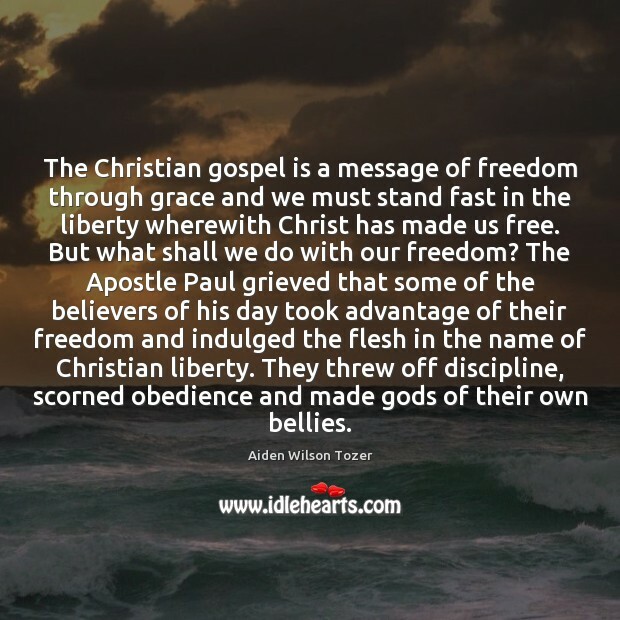 The Apostle Paul grieved that some of the believers of his day took advantage of their freedom and indulged the flesh in the name of Christian liberty. They threw off discipline, scorned obedience and made gods of their own bellies. 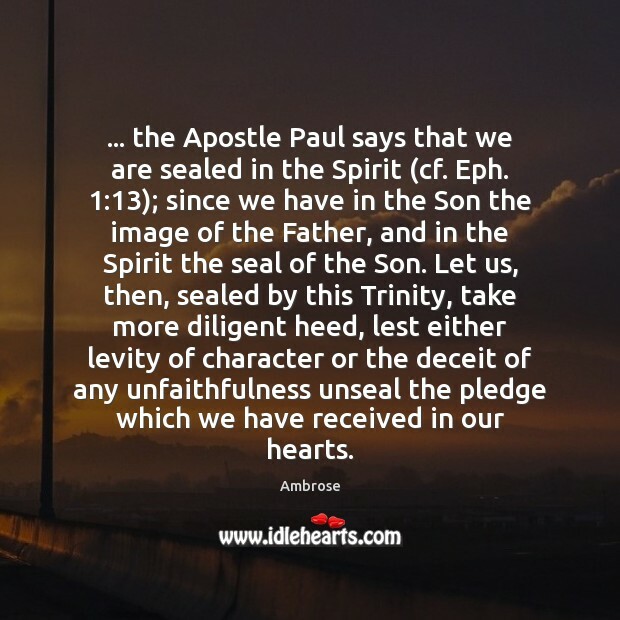 ... the Apostle Paul says that we are sealed in the Spirit (cf. Eph. 1:13); since we have in the Son the image of the Father, and in the Spirit the seal of the Son. Let us, then, sealed by this Trinity, take more diligent heed, lest either levity of character or the deceit of any unfaithfulness unseal the pledge which we have received in our hearts. 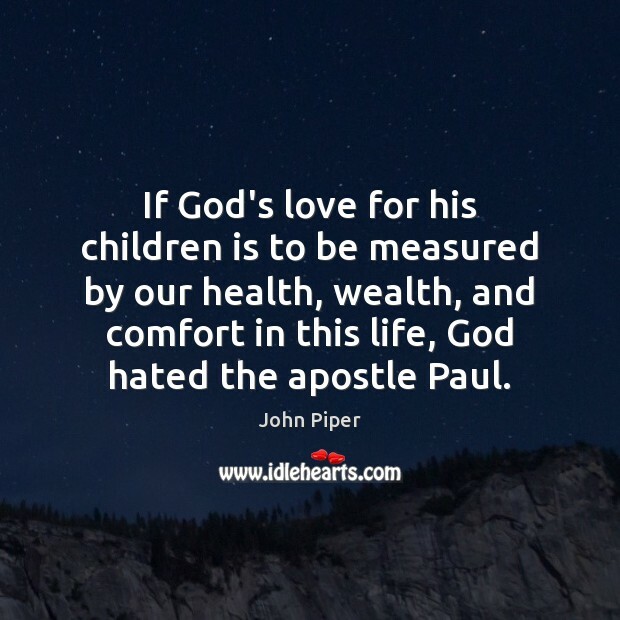 If God's love for his children is to be measured by our health, wealth, and comfort in this life, God hated the apostle Paul. 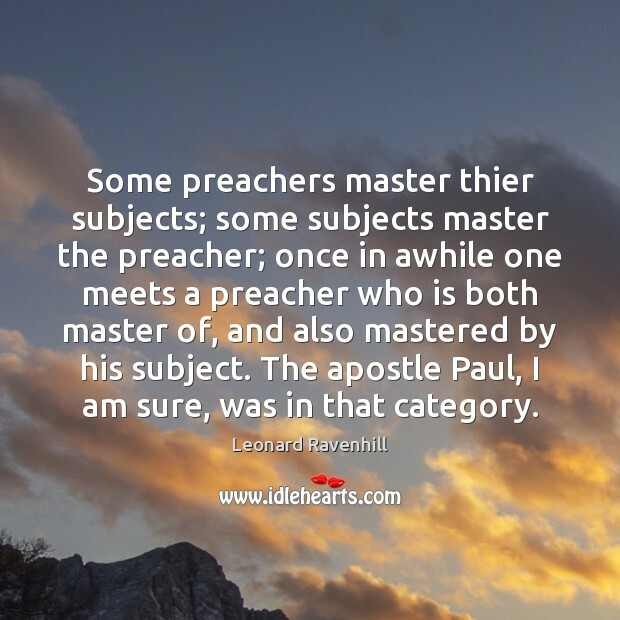 Some preachers master thier subjects; some subjects master the preacher; once in awhile one meets a preacher who is both master of, and also mastered by his subject. The apostle Paul, I am sure, was in that category. 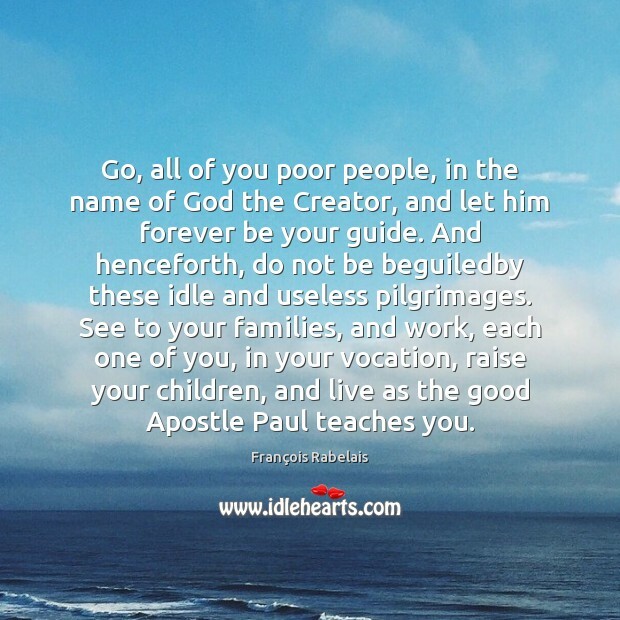 Go, all of you poor people, in the name of God the Creator, and let him forever be your guide. And henceforth, do not be beguiledby these idle and useless pilgrimages. See to your families, and work, each one of you, in your vocation, raise your children, and live as the good Apostle Paul teaches you. Millions of people profess and call themselves Christians, whom the Apostle Paul would not have called Christians at all. 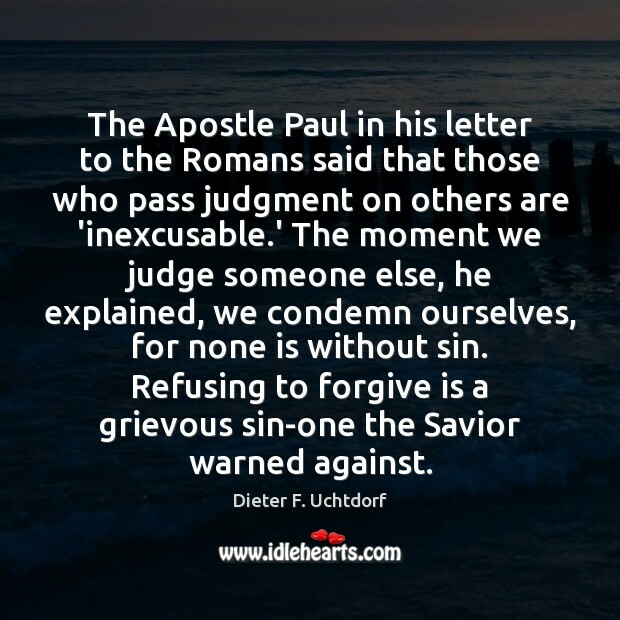 The Apostle Paul in his letter to the Romans said that those who pass judgment on others are 'inexcusable.' The moment we judge someone else, he explained, we condemn ourselves, for none is without sin. Refusing to forgive is a grievous sin-one the Savior warned against. 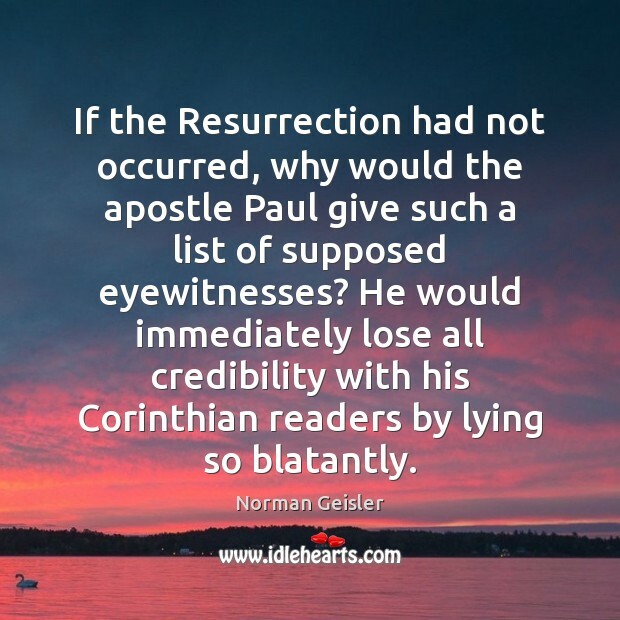 If the Resurrection had not occurred, why would the apostle Paul give such a list of supposed eyewitnesses? He would immediately lose all credibility with his Corinthian readers by lying so blatantly. Provide yourself with such work for your hands as can be done, if possible, both during the day and at night, so that you are not a burden to anyone, and indeed can give to others, as St. Paul the Apostle advises (cf. I Thess. 2:9; Eph. 4:28). 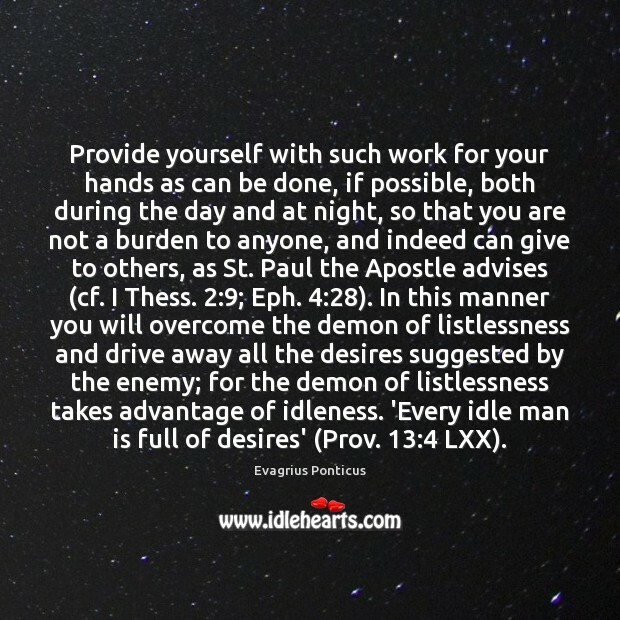 In this manner you will overcome the demon of listlessness and drive away all the desires suggested by the enemy; for the demon of listlessness takes advantage of idleness. 'Every idle man is full of desires' (Prov. 13:4 LXX). In his essay 'Self-Reliance' Emerson wrote, 'Whoso would be a man must be a nonconformist.' 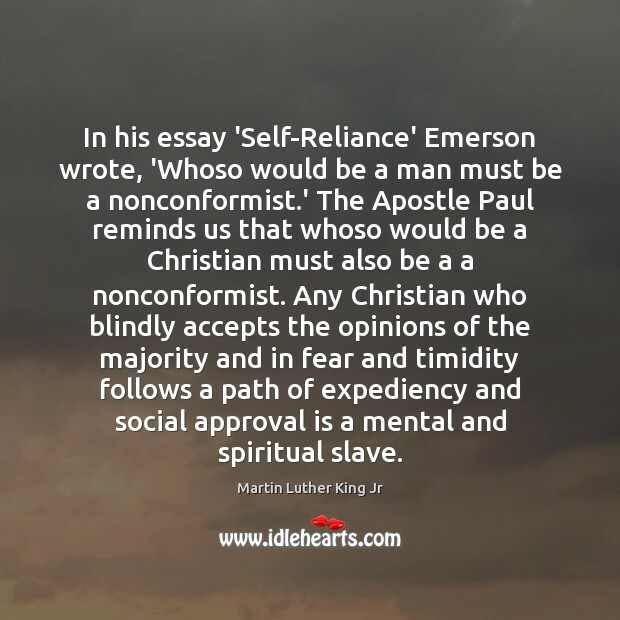 The Apostle Paul reminds us that whoso would be a Christian must also be a a nonconformist. Any Christian who blindly accepts the opinions of the majority and in fear and timidity follows a path of expediency and social approval is a mental and spiritual slave. Suffering is an oxymoron. There is unfathomable peace and satisfaction in suffering for Christ. It is as though you have searched endlessly for your purpose in life and now found it in the most unexpected place: In the death of your flesh. It is certainly a moment worth of laughter and dance. And in the end it is not suffering at all. 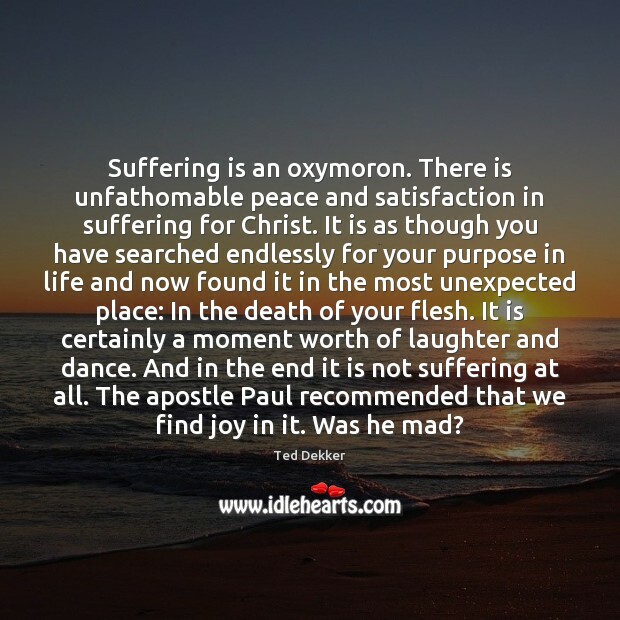 The apostle Paul recommended that we find joy in it. Was he mad? I am in Birmingham because injustice is here. Just as the eighth century prophets left their little villages and carried their "thus saith the Lord" far beyond the boundaries of their home towns; and just as the Apostle Paul left his little village of Tarsus and carried the gospel of Jesus Christ to practically every hamlet and city of the Graeco-Roman world, I too am compelled to carry the gospel of freedom beyond my particular home town. 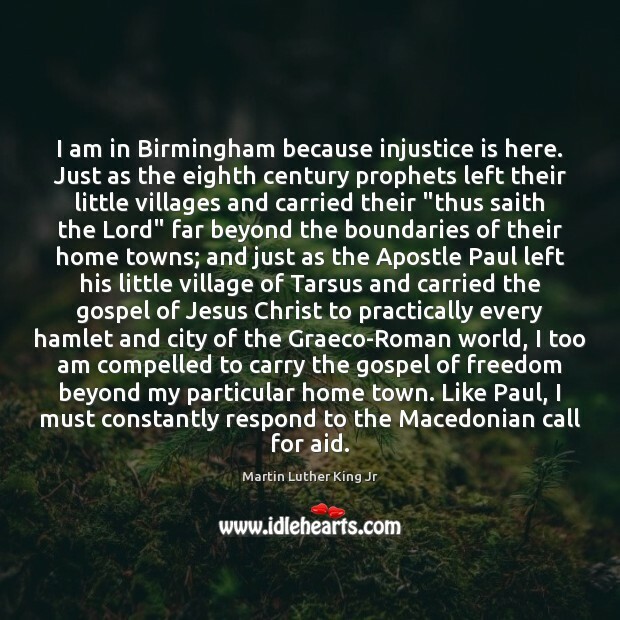 Like Paul, I must constantly respond to the Macedonian call for aid. I do not forget that I am a mechanic. I am proud to own it. 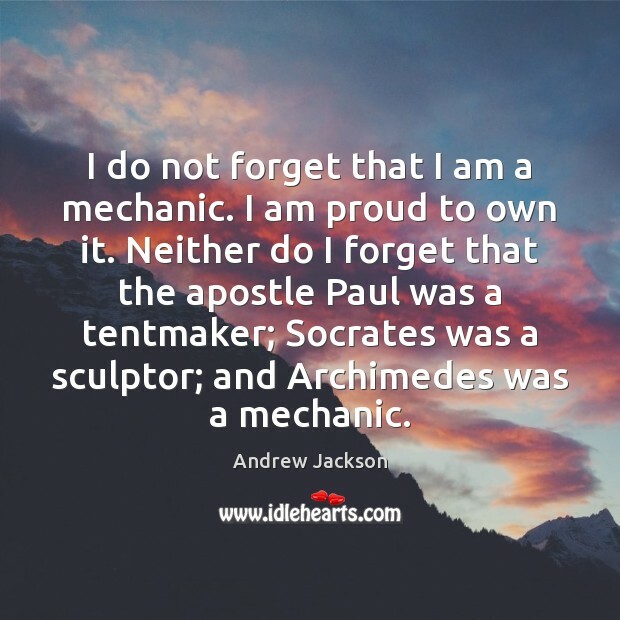 Neither do I forget that the apostle Paul was a tentmaker; Socrates was a sculptor; and Archimedes was a mechanic.